If you’ve ever had to open a can, you can agree that the best electric can opener should be easy of use, made of a strong material, and able to handle all size cans. That was our top criteria for selecting the best electric can opener. 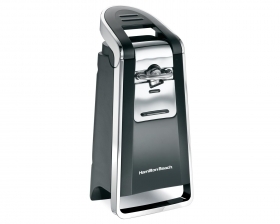 The Hamilton Beach electric Can Opener scored high marks in every category and is our top pick. Consumers do research on items they are interested in purchasing all the time. Whether the item is large like a major appliance or bicycle, or something much smaller like an electric can opener or toaster, checking reviews to see which ones are better than others can prevent them from making a purchase they end up not liking. We have taken the three top electric can openers that rank in the top ten on review boards and gone into detail so you, the consumer, know WHY they are in the top ten. What makes them so good? What are customers saying about them? What features do they have? You’ll learn the answers to these questions and more as we provide all of the information you need to make a good decision on which can opener would fit what you are wanting and needing. Having all this information at your fingertips, rather than having to go from one site to another, makes choosing the right can opener for yourself much easier. It’s why we provide this electric can opener review. Now you can have the information you need all in one place. 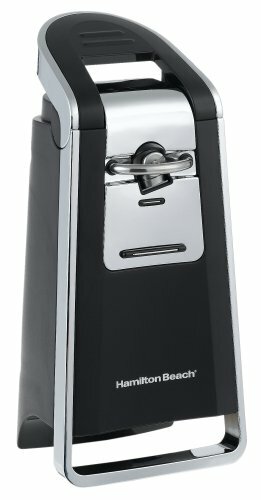 The Hamilton Beach deluxe can opener can open all kinds of cans including those with pop-top lids. The side cutting action leaves no sharp edges to get cut on. The ergonomic level is very easy to operate and the extra tall design works on larger cans as well. The black and chrome style works well with virtually any kitchen décor and looks great sitting on the counter. This deluxe can opener makes opening cans a snap. You’ll not want to go back to a manual can opener after trying this one out. One of the great features of this can opener is that no blade on the opener touches any food. The benefit to this is not getting the blades contaminated by any food which can then cause bacteria to grow on the blades. Since no food touches the blades, this is not a worry users will have. This sleek chrome and aluminum electric can opener looks great on any counter top and its slim design doesn’t take up much space at all. The extra tall design works on super tall cans easily. This electric can opener has a bottle opener and knife sharpener built in. The chrome cutting accessory is detachable and is dishwasher safe. The cord conveniently stores inside the base. 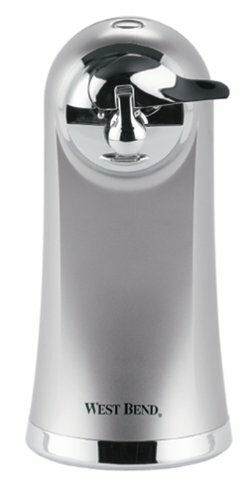 This West Bend 77203 electric can opener makes a great wedding gift or housewarming gift too that your recipients will love every time they use it. This striking red and brushed stainless steel electric can opener looks fantastic sitting on the counter and goes along with a variety of other red kitchen accessories that can make your kitchen really stand out. The extra tall capability means you can open even taller soup cans with ease and you won’t have to tilt them to do it. This particular Ensemble design has a matching coffee maker, toaster and blender to truly outfit your kitchen in a bright, sharp red and chrome color. The cutter can be removed and washed in the dishwasher safely and it has a built in bottle opener on the back. These three electric can opener choices are all excellent and any one of them would be a great addition to your kitchen. Electric can openers make fast work of opening cans which is great if you have to open a lot of them at once for chili, baking, holiday cooking and other occasions. The information contained in this electric can opener review makes it much easier to choose one that you will get a lot of use out of and that will last you a long time. Customers love them and any one of the three we have reviewed for you, have a sleek, attractive design that complements any kitchen décor. What is a Electric Can Opener? Everyone has a can opener of some kind in their home. Electric can openers were luxuries that not every had decades ago, but now they are just as common as manuals. In fact, most homes now have electric can openers of some kind and finding a manual one is getting harder. The goal of all electric can openers is the same…to open canned good. However there are many styles, designs, colors and features that they can have now that you may be surprised at all the choices you find when you start looking. Some can openers are countertop designs; others may be mounted underneath cabinets. There can be extra tall styles and styles that leave perfectly smooth edges on the can lid that it removed. This buyer’s guide will tell you all you need to know about finding the best electric can opener you can find that will fit your needs, your budget and your kitchen décor too. Well over a century ago, food was stored in metal cans long before a can opener was invented. In 1858, a bayonet and sickle can opener can onto the scene but before then people would use knives, hammers and chisels. 1870 brought with it the invention of a can opener that used a wheel shaped cutter. This was invented by William Lyman. The Star Can Company is responsible for the design of the manual can opener that is still around today. A few years after William Lyman created his invention, the Star Can Company came out with an opener that not only had the rotating cutting wheel, it had a wheel with a serrated edge as well. It is this design that is still scene in manual can openers today. In the 1930s electric can openers came onto the scene but really didn’t get popular until the 50s. Union Die Casting Company is responsible for the first free standing electric can opener that would sit right on your countertop. It also had a knife sharpener. It wasn’t until the 80s that the much safer, side cutting can opener was invented. The hands-free design came a little later. Fortunately operating an electric can opener doesn’t require much if any physical effort. If you have limited strength or arthritis, this can make them perfect for getting those cans open easily without pain or struggle. The speed in which an electric can opener opens cans is also a benefit to a busy cook. New models of electric can openers have removable parts that can be washed in the dishwasher which helps prevent bacteria from growing on the cutting parts. There are several different styles of electric can opener available on the market today. The prices range from a few dollars to tens of dollars depending on how fancy you want to get. Different models come with different features as well. The most common style of electric can opener sits right on the counter in an upright position. Some people leave them out and others put them away until they are needed. The shorter models don’t accommodate tall cans that are often purchased but now extra tall can openers are very common and getting one that can accommodate those tall cans is very easy. Electric can openers are very similar in function to a manual one. The major difference is that the mechanism is done automatically and not done by hand. A small motor in the opener operates a gear that turns the wheel and turns the can while the blade cuts the lid. Most of the electric can openers nowadays have a magnetic arm that catches the lid which makes everything much cleaner. Electric countertop can openers have cords and must be plugged in to use. Sometimes the cords can be inconveniently short. Handheld models can either have cords or be cordless. Cordless varieties of the handheld electric can opener are much more convenient to use and store. Some are battery powered and others have a charging base. There are a few different styles of handheld electric can openers and many people like the convenience of a handheld without the aggravation and effort a manual requires. 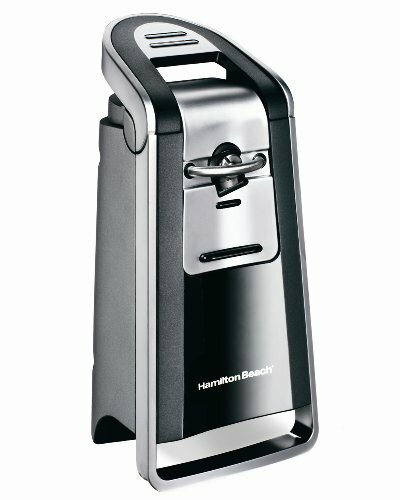 This style of electric can opener is permanently mounted to the bottom of a kitchen cabinet. This means they don’t take up any additional counter space and don’t have to be stored away or pulled out when it’s time to use them. Many of these under-the-cabinet models also have bottle openers, jar openers and plastic bag slitters built right into the can opener making them convenient AND multi-functional. The only drawback to the under-the-counter models is that they are much harder to clean and repair if something goes wrong. Side-cutting, electric can openers reduce injuries that are commonly caused by the jagged edges of can lids. The way these models work is to pierce the side of the can just below the rim and cut around the can that way which gives a smoother and safer edge. You may need to store this type of can opener in a drawer or cupboard as they may not stand upright. Commercial and industrial electric can openers are used by restaurants, caterers, and even serious cooks that prepare large amounts of food at a time. These heavy-duty, durable models can handle heavy use and those huge cans without wearing out. They tend to be extremely expensive and heavy but they routinely outlast and outperform smaller models. Some industrial and commercial openers have 2 speed motors, are rust resistant, and made of all metal. They are not commonly used in homes unless the cook does a LOT of cooking on a regular basis and feels like it is a better investment. Electric can openers can have an array of features that you can choose in the different models. We’ve outlined the most common features that they can have below. Knife sharpeners – sharpen your kitchen knives easily right on your electric can opener. Bottle openers – Most electric can openers have bottle openers as well, these are usually placed on the back of the can opener. Jar openers – this feature isn’t as common but is very convenient if you’ve ever tried to get as jar open and couldn’t. The jar openers are MUCH safer than either hurting your wrist or banging on it with the end of a butter knife. Colors – The color choices for can openers cover all kitchen décor that you could possibly imagine. Red, orange, blue, green, black, chrome and more are all available for you to choose from. Extra tall – don’t struggle with those tall cans again with the extra tall models that handle tall cans with ease. Auto-shut off – most of the electric can openers have this feature which is simply shutting off once the lid is removed completely. Built-in cord storage – Many models have a place inside the base that the cord can be stored which makes it much more convenient than wrapping the cord around the opener. Removable cutting accessory – the cutting accessory that cuts the cans can be removed and washed in the dishwasher on many models now that is great for keeping the electric can opener bacteria free. Magnetic lid holder – This is a magnetic arm that holds onto the lid while it’s being cut. Once the can is cut and removed, the lid stays attached to the magnetic arm for easy disposal and you won’t have to fish it out of the can. Maintaining your electric can opener can keep it working great for a long time to come. The maintenance required is not hard or even time consuming but it makes a big difference in how long your opener will last. One of the most important things to remember about keeping your electric can opener running well is to use it for its intended use. Don’t use a smaller model to open tons of large, heavy cans and so on. Using the right opener for the job will make the job easier and will keep your can openers running well, too. Can openers can get gummed up with food from the cans they open very easily, so ensuring that you clean it regularly will keep bacteria from spreading as well as keep the opener running smoothly. NEVER submerge an electric can opener in a sink of water. Cleaning it can be done with cleaner and a rag and just wipe it down thoroughly after it is unplugged. A toothbrush can be used for the harder to reach areas. Blades and gears should ideally last from 2500 to 5000 cans. If your electric can opener has replacement parts, be sure to replace these parts when they become worn if you don’t want to buy a new one. If you have a bug problem in your home you might want to take extra precautions to protect your electric can opener while you are getting rid of the pests. They are drawn to can openers due to the food particles that are left on them and can get inside the mechanism and cause all kinds of problems and contamination. Inspect the power cord regularly to ensure there are no frays, nicks or problems with the plug or cord. Below we’ve detailed some of the most common things that can go wrong with an electric can opener. If any of these things happen, follow the advice given. You should not service the electric can opener unless it is completely unplugged and you are familiar with working on small appliances. Problem #1 – Won’t run at all – Make sure that the outlet the can opener is plugged into has not tripped and that the cord is not faulty. Problem #2 – Motor stops – If the can opener starts and then stops running it’s possible the motor’s internal overload protector has been tripped. Unplug it for 10 minutes and wait for the motor to cool and then try again after plugging it back in. Be certain that you are not trying to open cans that are too large and heavy for the model you have. Problem #3 – The cutting wheel moves but does not cut the can properly – this means that the cutting wheel has probably worn down and is not sharp anymore. This is usually a replaceable part and can be ordered easily. Problem #4 – If the can doesn’t turn even though the feed gear rotates – The gear may be gummed up. Take a stiff brush and clean any food particles and residue from the gear teeth and then see if it works. If it still doesn’t you can replace the feed gear. Problem #5 – Motor runs but feed gear doesn’t rotate – this could indicate worn gears. If you want to take the can opener apart, unplug it first and then check for worn gears. You can replace the gears if they are defective. Even if one is defective, be sure to replace both. Cleaning an electric can opener is not a difficult task but it is one that should be done about once a week in addition to wiping it off with a damp rag after every use. Doing these steps weekly will help keep your electric can opener in good running condition. Even though they are not super expensive to replace, there’s no reason to have to replace it sooner than is necessary. Taking care of it properly will prevent premature replacement. Wipe can opener after every use by taking a sponge and dampening it in hot soapy water. Dishwashing liquid is just fine) Wipe everything down carefully and then dry to avoid the wheel from getting rusty. Remove the cutting wheel and the lid holder and soak in hot sudsy water once a week and then air dry or wash in the dishwasher. That’s all there is to cleaning your electric can opener. These simple steps will keep it looking like new for years. Electric can openers can be one of the most often used small appliances in your kitchen. Finding one that you will find easy to use and also functional and versatile will make the purchase well worth your time. With so many choices out there, you can take the information in this buyer’s guide and know exactly what you’re looking for as well as the features you’d like to have.